NEW YORK (Reuters) - The dollar rose against a basket of currencies on Friday, rebounding from a near 1-1/2-month low, due to upbeat U.S. economic data and safe-haven demand on reports U.S. President Donald Trump wants to slap duties on $200 billion of Chinese goods. Higher Treasury yields also lifted the dollar with the 10-year yield touching 3 percent for the first time in six weeks. Reports that Trump told aides to proceed with tariffs on Chinese goods came after Chinese officials welcomed an invitation from Treasury Secretary Steven Mnuchin for new talks to resolve the Sino-U.S. trade conflict. The reports pushed China's offshore yuan even lower after initially falling on mixed economic data. "Generally today's data showed strong results, which are supporting the dollar," said Brian Daingerfield, macro strategist at NatWest Securities in Stamford, Connecticut. U.S. domestic retail sales rose 0.1 percent in August, the smallest gain in six months, but July figures were revised higher, supporting the view of solid consumer spending in the third quarter. The University of Michigan's U.S. consumer sentiment data in early September and last month's industrial output gain also proved to be bright spots. "You're just going to get a stronger dollar. It's not going to be temporary," said Alicia Levine, BNY Mellon Investment Management's chief strategist in New York. Friday's data offset this week's disappointing inflation data, which caused traders to cut their bets inflation is accelerating but did not change their view the Federal Reserve would raise interest rates later this month, analysts said. Chicago Fed President Charles Evans on Friday cautioned the central bank's rate hikes would take a toll on U.S. growth by 2019. An index that tracks the dollar against six major currencies <.DXY> was up 0.4 percent at 94.926 on Friday, trimming its weekly decline to 0.4 percent. The dollar index fell to a near six-week low on Thursday as encouraging developments between Britain and the European Union on terms for Britain's exit from the economic bloc boosted the euro and sterling, and pared safe-haven demand for the dollar. 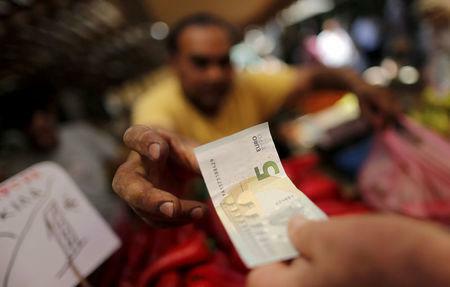 The euro climbed to a two-week high earlier on Friday before retreating against the greenback. The common currency was down 0.5 percent at $1.16325, EBS data showed. Sterling was 0.3 percent lower at $1.3063 after hitting $1.3145 earlier on Friday, its highest level since July 31, according to Reuters data. The first of three Brexit summits are set in the coming week, where EU leaders hope to settle an agreement for departing Britain within the next two months.